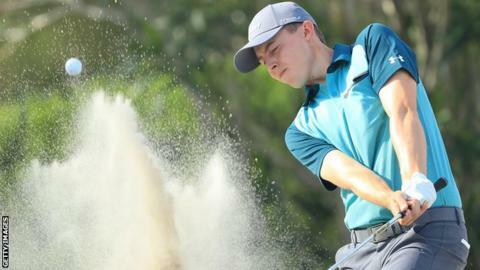 Englishman Matthew Fitzpatrick produced a bogey-free five under 67 to take a one-shot lead after round three at the Arnold Palmer Invitational in Orlando. The world number 44, seeking his first PGA title, made five birdies to reach nine under at Bay Hill. Rory McIlroy, seven back overnight, had seven birdies in a 66 and is second. Joint second-round leaders Tommy Fleetwood and Keegan Bradley had begun four shots clear of the field but Fleetwood returned a 76 and Bradley 75. As the course dried, the putting surfaces became dangerously fast and difficult to hold, with Fleetwood taking four shots from the right of the 10th green for a double bogey and making only one birdie at the last. Bradley, who bogeyed his first three holes, holed a long putt at the last for a 75 and is three behind. The challenge came from Fitzpatrick, the 24-year-old from Sheffield, who joined McIlroy at eight under after his fourth birdie of the day at the 15th. He took the outright lead at the next hole with a tap-in birdie at the par-five and then saved par from a perilous position in the sand at the 17th. In the sand again at the last to the left of the green, he calmly played out to three feet and secured par. "It was a great day," said Fitzpatrick, who has won five times on the European Tour, winning three times out of four when leading after 54 holes. "Anything can happen tomorrow, I can shoot 80 or 65 but I've really worked over the winter so hopefully one more good round and we'll see." World number six McIlroy holed from 26 feet for a birdie at the fifth and then played to within inches of the cup from a downhill lie in the bunker for another at the next. He took two to escape from the sand for his only dropped shot of the round at the eighth, but pitched to within a foot with his 161-yard approach at the 15th and finished with another birdie after pitching inside 10 feet from 150 yards at the last. The Northern Irishman, who was second behind Dustin Johnson at the WGC-Mexico Championship last month, has finished in the top five in his last four PGA Tour events. Fitzpatrick's playing partner, fellow Englishman Matt Wallace, holed some impressive putts, saving par from the edge of the green at the 17th and making five birdies in a 69 to move into a share of third at seven under. Tyrrell Hatton curled in a putt in excess of 27 feet at the second, one of seven birdies for the world number 33 in a 66 that moved him to five under, while world number two Justin Rose is a distant two over after sending two balls into the water and taking a triple bogey eight in his 77.